While out in my old stomping ground, I also visited the Old Mission Dam. 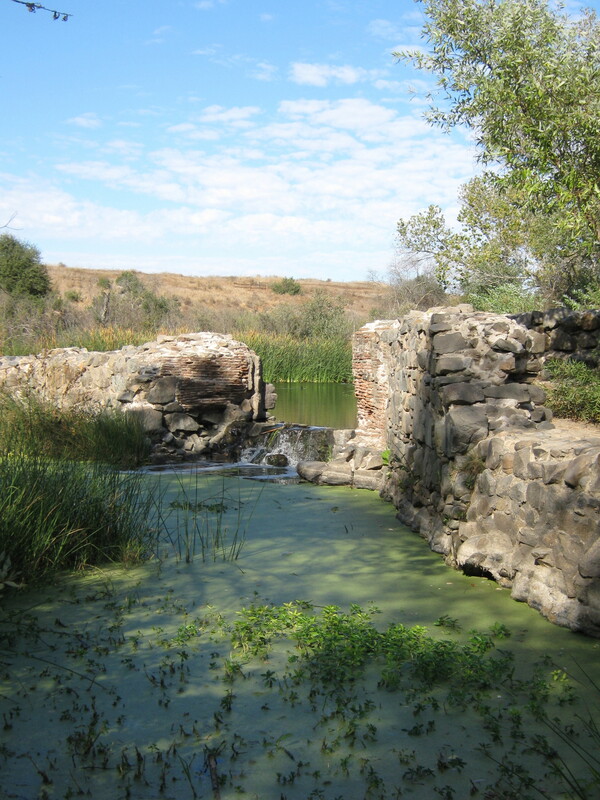 It was built in the early 19th century by the Indians and monks of Mission San Diego de Alcala to create a steady water supply from the San Diego river. Now it’s a quiet little park. There were ducks on the pond and fisherman across the way and the occasional hiker that afternoon. In this view from downstream, you can see the bricks interlaid with stone, and water pouring down. A little way up the riverbank, there were clumps of California goldenrod. And goldenrod means bees. The honey bees were easy enough to find. 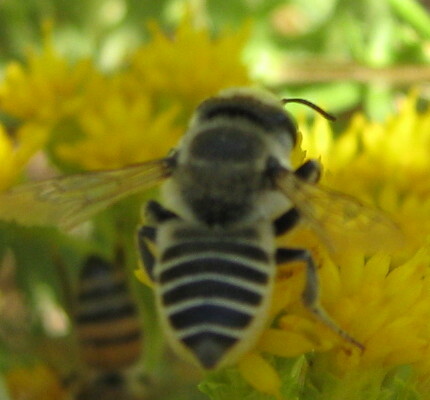 There’s even a honey bee on the other side from this gray bee, Megachile parallela. 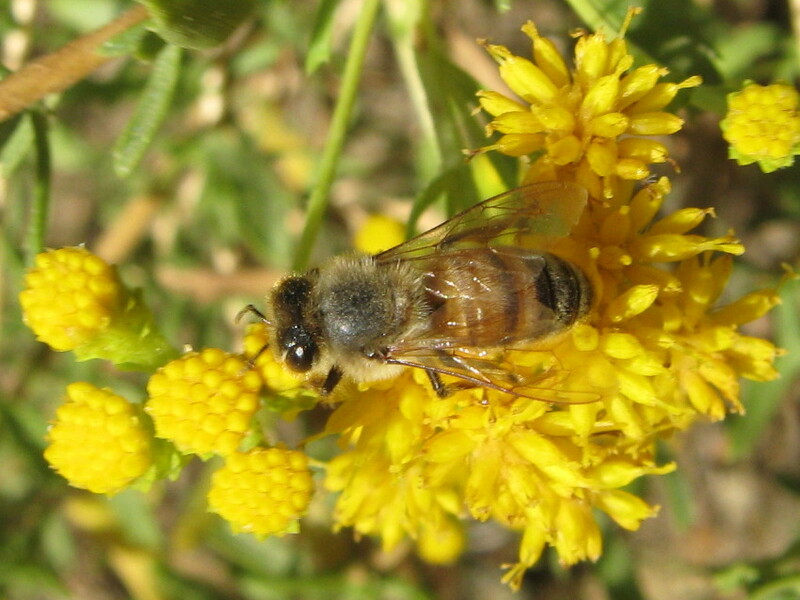 Much to my surprise, this is a different gray bee from the ones near Cowles Mountain, which turns out to be a digger bee in genus Anthophora. 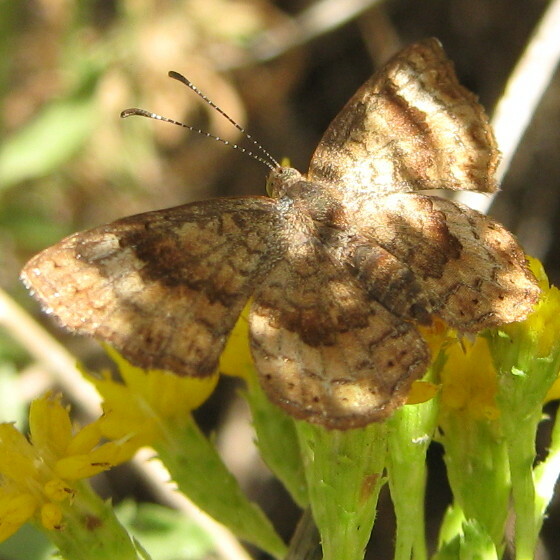 If it wasn’t for the motion of it flying past, I might have missed seeing this little brown Fatal Metalmark. Once it’s still, it nearly disappears into the dappled sunlight and shadow. Butterfly in dappled light. Honest. And now I’m going to disappear, slightly. I’ve come to the conclusion that I need some evening time to read, in order to have enough to write about. So I’ll be taking Mondays and Tuesdays off this blog. Until I change my mind again.